Ferguson’s recent crisis and the lack of indictment of former officer Darren Wilson has caused hundreds of protests and has brought up new waves of civil rights discussion across America. 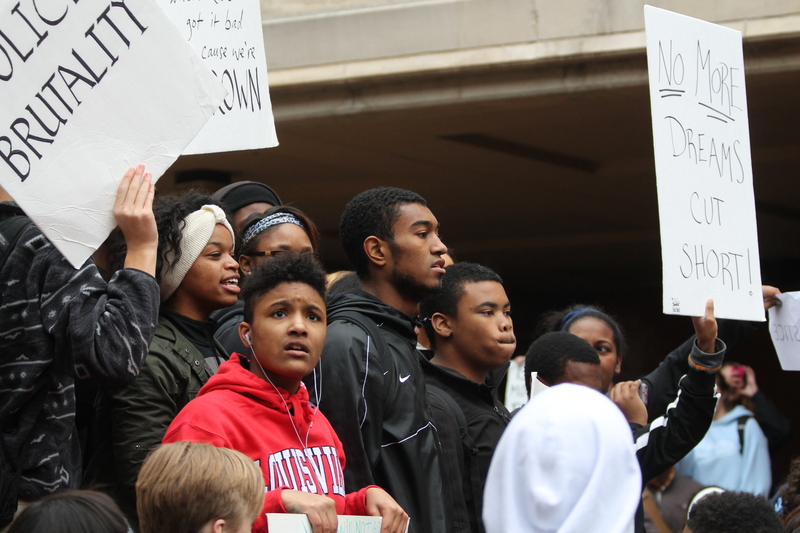 Across town, WGHS students made their voices heard on the incident in St. Louis’s backyard. 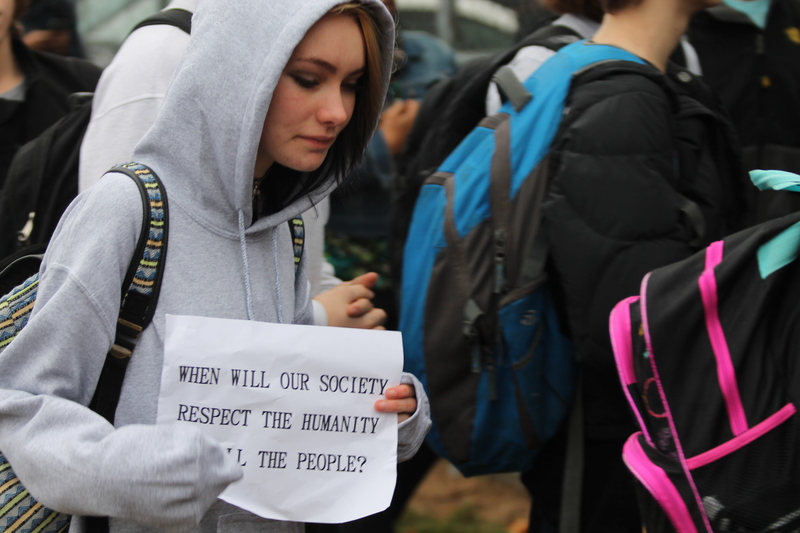 About 300 students walked out of the high school in protest on Thursday Dec. 4 at 12:30 p.m. They made their way out to Plymouth Softball Field, went through the parking lot and marched through the alley adjacent to the school, then finally returned to the courtyard. The protesters chanted, “Hands up, don’t shoot!” as they made their procession. Some students held signs which read, “Equal protection under the law,” “Stop the criminalization and victimization of black men,” “What do you call it when the police are the murderers?” and “What if Mike was white?” among other things. Once back in the courtyard, protesters circled into a pack and held a four-and-a-half minute of silence in representation of the four-and-a-half hours Michael Brown was left in the middle of the street after his death. At the conclusion of their silent tribute, the mass continued to chant and demonstrate their signs for a couple minutes, then was addressed by senior protester Dalia Escamilla. “This isn’t just for Mike Brown. This is for everything going on around the world right now!” shouted Escamilla to applause from the crowd. At the end of her statements, senior Stu Hollansworth shouted for students to “Go back to class now, get your education,” receiving yells of disagreement. Moments later, though, the crowd was dispersed. 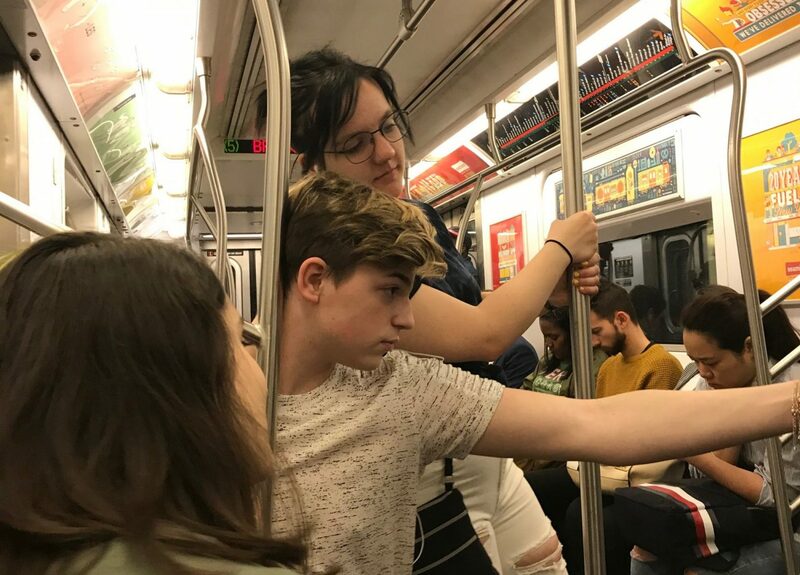 “We appreciated that students went out and did what they needed to do for 15-18 minutes, and they stayed safe,” principal Dr. Jon Clark commented. Students who participated in the walkout were marked as tardy for cutting a portion of their fifth hour class but were issued no further punishment. Before the protests came to the high school, an impact was already being made on WGHS by the grand jury’s decision. Tacky Day was brought to a sudden end before it even started on Tuesday, Nov. 25, when a district-wide call was sent by superintendent Sara Riss cancelling school due to the civil unrest following the grand jury’s ruling the night before. In Ferguson, protesters had been overturning police cars and burning down businesses all night, prompting the cancellation of all WGSD schools for the safety of students. School was back on the next day for Spirit Day, and on Thanksgiving afternoon the board elected to let the annual Turkey Day Game be played. “We hoped we’d get to play some football and fortunately nothing happened, but we were prepared,” Ice said. Webster students waited until the next week to make their point. They tried originally to hold the walkout on Monday, Dec. 1, but word was not widely spread well enough. Instead the protest was postponed to Thursday.